Identify where and when to specify double acting impact traffic doors for increased operational efficiency. Discuss the types of hinge configurations to meet operational goals in various commercial applications. Compare the styles of double acting traffic doors, their composition, and installation considerations. Describe the range of considerations in proper specification of double acting doors including expected traffic level, finish material, regulatory concerns, and other factors. As a movable structure used to open and close an entrance, a door has many jobs. Doors admit people, ventilation, and light. They create privacy, distance, and space from the other aspects of a building. They keep cold or heat in or out, control the spread of dust, and noise, and provide security. In commercial applications, the list of door functions and objectives grows to include the efficient passage of people and goods, the ability to withstand moderate and heavy traffic, and the capacity to separate building functions coupled with ease of maintenance and aesthetic qualities consistent with the look of the facility. Opening with a light assist and closing automatically in a safe, gradual manner, double acting traffic doors are one option that achieves these goals. As opposed to doors that swing one way, and open and close manually via a knob, lever, push bar, or related device, double acting traffic doors open easily in both directions, simply by pushing on them, after which they automatically return to their closed position. 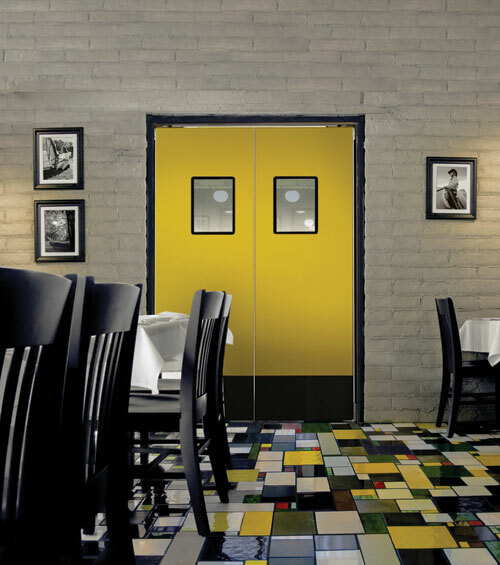 Used extensively in restaurant, retail, institutional, and industrial situations, double acting doors allow personnel and materials to travel more quickly between two sections of a building while acting as a separation between public and backroom operations. In commercial scenarios where bottom line considerations are key, double acting impact traffic doors represent a basic cost-effective strategy for efficient movement, while providing necessary screening functions. This article will discuss the basics of double action doors, their applications and various hinge scenarios, focusing on where and how to specify them to meet goals. Double acting describes a door that swings in both directions, in and out. Because of this feature, the door always swings away from the person or load passing through it, allowing easy and safe passage. In addition to being bi-directional, double acting doors open upon impact, automatically center in the opening upon closing, and do not typically close against a door stop. Double acting doors facilitate small or very large openings by using a single panel or a double panel, or a pair configuration. In the most efficient double acting traffic doors, impact “shock” is spread throughout the door components so it is absorbed without damage. The doors open with minimal impact (typically less than 10 pounds of pressure) and then automatically return to the closed position. Double acting traffic doors promote efficient movement while acting as a barrier for visual, sound, and environmental purposes.